KUALA LUMPUR (March 23): Gamuda Bhd, which saw its share price hit an all-time high today, reported a 4% growth in net profit in its second financial quarter ended Jan 31, 2017 (2QFY17) to RM166.26 million from RM160.11 million a year ago, as it registered higher revenue. It also attributed the better earnings to cost savings enjoyed from the near completion of underground works of the Klang Valley Mass Rapid Transit (KVMRT) Line 1. Quarterly revenue jumped 62% to RM853.88 million from RM527.43 million a year ago, mainly due to higher work progress of underground and elevated works of the KVMRT Line 2 (Sungai Buloh-Serdang-Putrajaya). For the cumulative six-month period, Gamuda's net profit rose 2% to RM328.41 million from RM321.35 million a year ago, while revenue climbed 31% to RM1.36 billion from RM1.04 billion. Gamuda said the 43% rise in revenue for its property division in 1HFY17 to RM515.08 million from RM359.31 million a year ago was mainly attributed to the higher sales for its Vietnam properties. However, the 14.9% decrease in profit before tax for the segment to RM84.05 million from RM98.73 million a year ago was due to the softening of the Malaysian property market. As for its water and expressway concessions division, Gamuda said the segment's increase in revenue of 15.9% to RM246.76 million in 1HFY17 and 6.6% increase in 1HFY17 profit before tax to RM217.19 million mainly resulted from the toll-rate hikes of certain expressways. 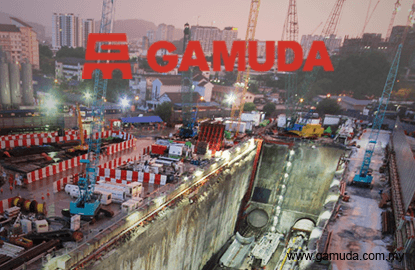 On prospects, Gamuda expects to post a good performance this year on the steady earnings of its expressway concessions division and the ramping up of works for KVMRT Line 2. Gamuda said KVMRT-Line 1 (Sungai Buloh-Kajang line) was at 98% completion as at end of February 2017. "Phase 1 was completed two weeks ahead of schedule on Dec 15, 2016 and full completion is expected by July 2017, with no significant cost overruns so far. "Commencement of Phase 2 Trial Operations remains on target for May 1, 2017," the group said. As for KVMRT-Line 2 (Sungai Buloh-Serdang-Putrajaya), utilities relocation, earthworks, piling, and pier construction are progressing for Packages V201 (Sungai Buloh to Persiaran Dagang), V202 (Persiaran Dagang to Jinjang), V203 (Jinjang to Jalan Ipoh North Portal) and V210 (Persiaran APEC to Putrajaya Sentral). On the Penang Transport Master Plan, Gamuda said the Penang state government has held a public dialogue for the Environmental Impact Assessment on the Penang South Reclamation and the final Environment Impact Assessment report will be submitted to Department of Environment for its review and approval next month. Gamuda's property division sold RM783 million worth of properties in the first half of this year, double that of the RM385 million sales registered in the first half of last year. The better performance is mainly contributed by the robust sales from overseas projects, and improved sales from Horizon Hills in Iskandar, Johor, Jade Hills in Kajang, Selangor, and Bukit Bantayan Residences in Kota Kinabalu, Sabah. Unbilled sales at the end of the current quarter stood at RM2 billion. As for the takeover of Syarikat Pengeluar Air Sungai Selangor Sdn Bhd (Splash), Gamuda said the Selangor State Government and the Federal Government are currently finalising certain matters among themselves in order to complete the takeover. Gamuda shares closed up 10 sen (1.94%) at RM5.25 today, and for a market capitalisation of RM12.74 billion. The stock has been steadily climbing since December last year, when it was trading around RM4.70.